The world’s most renowned female director, Claire Denis (Beau Travail, White Material), delivers a refreshingly honest tale of a middle-aged woman’s quest for love in her witty and heart-warming new film, Un Beau Soleil Intérieur. Isabelle (Juliette Binoche) is a stylish and accomplished artist living in Paris. Divorced and looking to find true love at last, she meets a handsome, kind and intelligent younger man who she thinks might finally be the one. But when he calls their affair a mistake and returns to his wife, Isabelle must again face the issue of mid-life loneliness. Sifting through former lovers, new admirers, jealous friends and chance encounters, will she find a fulfilling match? Or will she discover a new path to happiness along the way? 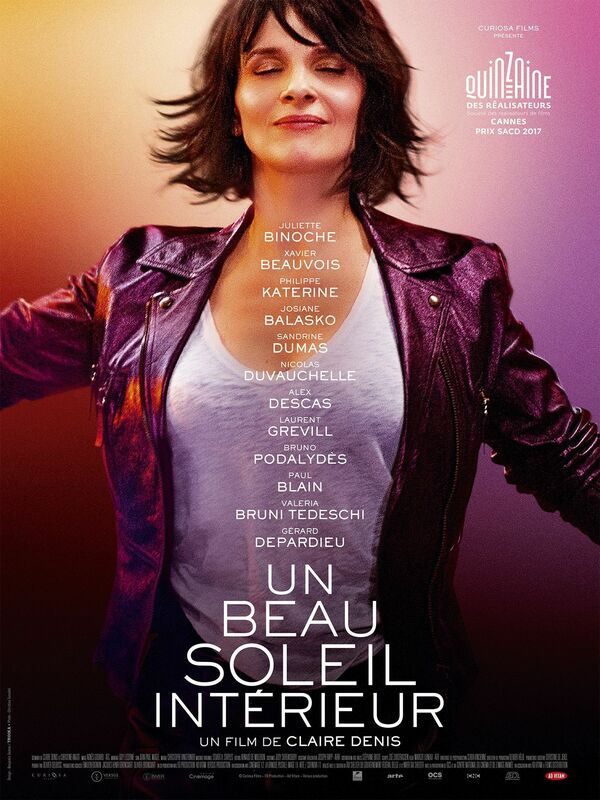 Led by an outstanding performance by the incomparable Juliette Binoche, and featuring a scene-stealing appearance by Gérard Depardieu, Un Beau Soleil Intérieur is a truly unique, touching and beautifully relatable piece of cinema from one of the world’s greatest living filmmakers.